Honda Automobile Thailand (HATC) has resumed production at its plant in Ayutthaya after severe floods halted operations in early October. HATC, a subsidiary of Honda Motor, is the last of the Japanese automobile companies to resume production in Thailand after the floods. Toyota Motor and Nissan Motor resumed production at the end of 2011. The floods forced hundreds of Japanese companies to shut operations, adversely affecting their earnings expectations. Earlier this year, Honda revised down its operating income forecast for the year ending on 31 March to 200bn yen ($2.4bn, £1.5bn) from a previous forecast of 270bn yen. The Honda factory in Ayutthaya has the capacity to produce 240,000 units annually. 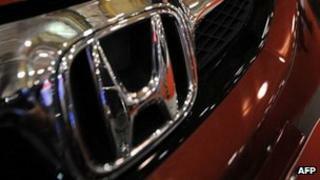 A Honda Motor spokeswoman said full production would resume at the HATC unit by the second week of April. Currently production is at about 12% of capacity. HATC was the only car maker whose factory was completely flooded. Honda Motor said HATC is one of its most important production centres in the Asia and Oceania regions. "Honda was totally committed to realising the earliest possible recovery. Honda will maintain the same positioning of HATC in the future and further promote business operations in Thailand," the company said.